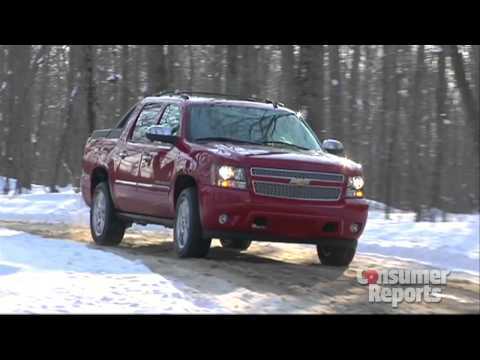 The 2013 Chevrolet Avalanche is part pickup, part SUV. Inside, it is virtually identical to the Chevy Suburban from the second-row seat forward. Out back is a short 63-inch cargo bed. A folding midgate between the bed and the flip-down rear seat extends the cargo area into the cabin for hauling bigger loads. This is the Avalanche's last year. This vehicle is the best car I have ever driven. The only problem I have encountered with this vehicle is that the check engine light comes on when there is no issue. It is performance is amazing and drives very smooth. Very reliable and good in all types of weather. The interior is very comfortable. It has black leather, heated seats, remote start, and a DVD player in the back seat. I luv this truck so much that it his one is my fourth avalanche to own. Fantastic ride. Designed to carry things I. Back portion because it is covered. I love this truck so much that I have owned four previous to the one I now own. I purchased the black diamond avalanche because 2013 was the last year Chevrolet is making the avalanche. I hope they return. It is by far the best vehicle I have ever owned. 2013 Chevrolet black diamond avalanche. Haven't had much problems. It is reliable and comfortable. The wide seats are good for car seats since I have kids. I do not like the back trunk because I have nowhere to put my groceries. It is too big so everything falls out and rolls around everywhere. Other than that it is good because I can tow stuff and fit big stuff.